Denise is a professional journalist (and former Newsday staff writer and columnist) who is lucky enough to write about the thing that she loves -- dogs! She's also fortunate to have a husband and kids who enthusiastically take part in her "dog life"! In 2015, Denise founded Revodana Publishing, which focuses on dogs books written by experts and fanciers with a deep and time-forged understanding of their subject matter. She runs Ridgeback Central (www.ridgebackcentral.com), which offers blog posts and questions-and-answers of interest to Ridgeback owners. And she is the publisher of Modern Molosser (www.ModernMolosser.com), a digital magazine and archive for Mastiffs, Dogues and Bullmastiffs, among others, as well the editor-at-large for Sighthound Review (www.SighthoundReview.com). Denise is a member in good standing of the Rhodesian Ridgeback Club of the United States (www.RRCUS.org) and the Western Hound Association of Southern California, and is a board member of the Morris & Essex Kennel Club (www.morrisandessexkennelclub.org). 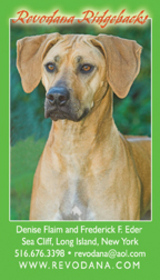 The long-time Ridgeback breed columnist for the AKC Gazette, she is the past chair and historian of the RRCUS Health & Genetics Committee, and now serves as a member of the Rhodesian Ridgeback World Congress Health Committee (www.worldridgebackhealth.org). In addition to her publishing company, Denise contributes frequently to Dog News and the Whole Dog Journal. She is a member of the World Dog Press Association and the Alliance of Purebred Dog Writers (www.purebreddogwriters.org). 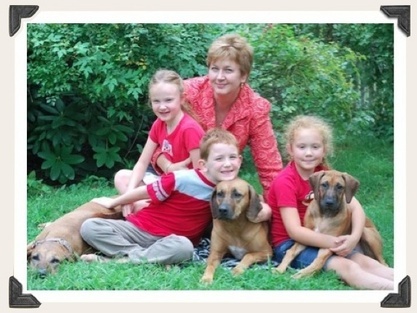 Denise is the author of "Your Rhodesian Ridgeback Puppy: The Ultimate Guide to Finding, Rearing and Appreciating the Best Companion Dog in the World," the children's book "How the Rhodesian Ridgeback Got Its Ridge" and "100 Memorable Rhodesian Ridgeback Moments."